As Holocaust museums and memorials proliferate, Center alumni are poised to assume leadership positions. Indeed they are doing just that as they continue to embrace opportunities for further research and public service. As the only program to provide doctoral education in Holocaust History and Genocide Studies, the Center is proud to serve as a training ground for future curators, education directors, and historians who will advance the field and enhance the education of teachers, students, and the public. Their activities, reported below, attest to the value of the Center’s enterprise of rigorous doctoral education. 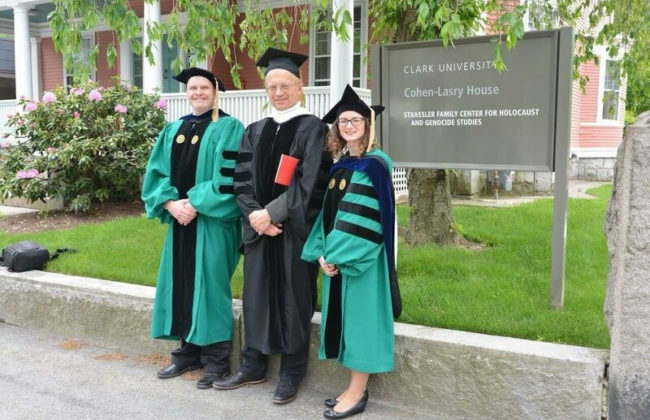 Michael Geheran, Ph.D. ’16, Dr. Thomas Kühne, and Joanna Sliwa, Ph.D. ’16. Psychotherapist, Private Practice, North Grafton. International Tracing Service Program Manager, Jack, Joseph and Morton Mandel Center for Advanced Holocaust Studies, U.S. Holocaust Memorial Museum, Washington, DC. Gender and the Genocide in Rwanda: Women as Rescuers and as Perpetrators, Routledge 2017. Child Survivors of the Holocaust: The Youngest Remnant and the American Experience, Rutgers University Press, forthcoming 2018; Case Closed: Holocaust Survivors in Postwar America (New Jersey: Rutgers University Press, January 2007. Director, Holocaust Educational Foundation, Northwestern University, Chicago, IL. Executive Director, Auschwitz Institute for Peace and Reconciliation, New York and Poland. Holocaust Survivors in Canada: Exclusion, Inclusion, Transformation, 1947-1955. University of Manitoba Press, 2015. Director of Development and Community Relations, MAZON: A Jewish Response to Hunger, Los Angeles, CA. The Holocaust and Compensated Compliance in Italy: Fossoli di Carpi, 1942-1952, Palgrave Macmillan US, March 30, 2016. Assistant Professor of Holocaust History, Chapman University, Chapman, CA. Social Studies Teacher, South Oldham High School, Crestwood, Kentucky. with Taner Akçam) The Spirit of the Laws: Plunder of Wealth in the Armenian Genocide, Berghahn Books, 2017. Genocide and Humanitarian Resistance in Ottoman Syria, 1915-1916″, Études arméniennes contemporaines, Vol. 7 (2016). Full-time Lecturer, University of Massachusetts, Dartmouth. The Jews of Nazi Vienna, 1938-1945, Palgrave Macmillan US, 2017. Assistant Professor of Holocaust and Genocide Studies, Sara and Sam Schoffer Professor of Holocaust Studies, Stockton University, NJ. Genocide in the Carpathians: War, Social Breakdown, and Mass Violence, 1914-1945 Stanford: Stanford University Press, 2016; Days of Ruin: The Jews of Munkacs During the Holocaust,Yad Vashem Publications, 2013.